Incessant mountain rain, snow and melting glaciers in a comparatively small region of land that hugs the southern Alaska coast and empties fresh water into the Gulf of Alaska would create the sixth largest coastal river in the world if it emerged as a single stream, a recent study shows. Since it's broken into literally thousands of small drainages pouring off mountains that rise quickly from sea level over a short distance, the totality of this runoff has received less attention, scientists say. But research that's more precise than ever before is making clear the magnitude and importance of the runoff, which can affect everything from marine life to global sea level. The collective fresh water discharge of this region is more than four times greater than the mighty Yukon River of Alaska and Canada, and half again as much as the Mississippi River, which drains all or part of 31 states and a land mass more than six times as large. "Freshwater runoff of this magnitude can influence marine biology, nearshore oceanographic studies of temperature and salinity, ocean currents, sea level and other issues," said David Hill, lead author of the research and an associate professor in the College of Engineering at Oregon State University. "This is an area of considerable interest, with its many retreating glaciers," Hill added, "and with this data as a baseline we'll now be able to better monitor how it changes in the future." The findings were reported in the Journal of Geophysical Research: Oceans, by Hill and Anthony Arendt at the University of Alaska-Fairbanks. It was supported by the North Pacific Research Board. 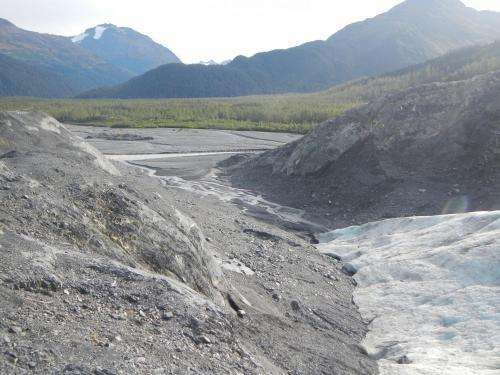 This is one of the first studies to accurately document the amount of water being contributed by melting glaciers, which add about 57 cubic kilometers of water a year to the estimated 792 cubic kilometers produced by annual precipitation in this region. The combination of glacial melt and precipitation produce an amount of water that's larger than many of the world's great rivers, such as the Ganges, Nile, Volga, Niger, Columbia, Danube or Yellow River. "By combining satellite technology with on-the-ground hydraulic measurements and modeling, we're able to develop much more precise information over a wider area than ever before possible," Hill said. The data were acquired as an average of precipitation, glacial melting and runoff over a six-year period, from 2003 to 2009. Knocked down in many places by steep mountains, the extraordinary precipitation that sets the stage for this runoff averages about 6 feet per year for the entire area, Hill said, and more than 30 feet in some areas. The study does not predict future trends in runoff, Hill said. Global warming is expected in the future, but precipitation predictions are more variable. Glacial melt is also a variable. 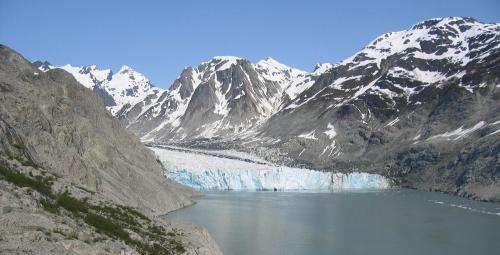 A warmer climate would at first be expected to speed the retreat of existing glaciers, but the amount of water produced at some point may decrease as the glaciers dwindle or disappear. Additional precision in this study was provided by NASA's Gravity Recovery and Climate Experiment, or GRACE satellites, which can make detailed measurements of gravity and, as one result, estimate the mass of glaciers they are flying over. As the glacial mass decreases over time, the amount of melted water that was produced can be calculated. The close agreement of land-based measurements also help confirm the accuracy of those made from space, a point that will be important for better global understanding of water stored in a high-altitude environment. Some of the processes at work are vividly illustrated at Glacier Bay National Park, where some of the most rapidly retreating glaciers in the world are visited each year by hundreds of thousands of tourists, many on cruise ships. You can argue about CO2 forever, this is happening, and measurable. In 2014 the polar ice caps expanded 155,000 square miles. 2015 is on pace to at least equal that. The global temperature has not gone up even one degree in 20 years. This article is Alarmist left wing hog wash.
You seem to have missed out on some facts. Record extent of seasonal, single year Antarctic sea ice only. West and East Antarctic Ice masses both in accelerating mass-loss regimes. Ditto for Greenland. Ditto for virtually all other glaciers, globally. Global land/sea surface temps continue increased warming trend. Oceans have taken up massive amounts of heat down to thousands of meters depth. That makes your comment just so much lying, trollish, denierside horsehit. Put a sock in it, porgie girl. If you wouldn't mind, please quote your sources, as well, when providing your data. I, for one, think it would be helpful. In 2014 the polar ice caps expanded 155,000 square miles. 2015 is on pace to at least equal that. Except, of course, that's not true. The south pole ice cap is shrinking and that continues at an accelerating rate. The north pole ice cap doesn't seem to be cooperating with your claims at the moment as it's currently the smallest on record for this date. The global temperature has not gone up even one degree in 20 years. This article is Alarmist left wing hog wash.
richie, they can also demonstrate that a 0.001% change in CO2 won't have measurable effects. It the difference between drinking a glass of water and drowning in it. Turn on the stove make some distance marks with a ruler near your stove, let it warm, and ascribe a metric to how hot it feels at given distances. Now open the doors and windows, assuming it's not freezing, and make the same observations. CO2 will have dropped 3-4x, humidity will have changed. How does it feel? If you like you can buy a CO2 meter and a humidifier and quantify the results. You'll find drastic changes in CO2 are undetectable. Yet small changes in humidity are noticeable. It feels much warmer to your skin with humidity, and the stove feels cooler, because of humidity. Both results are because water vapor, humidity, is a much much much more powerful green house gas than CO2. Try it! It is such a great difference it is obvious. @ Water_Prophet - We all know water vapor traps more heat than CO2. So does methane. But the change in CO2 since the beginning of the industrial age is > 40%, not 0.001% (from 280 to 400 ppm - http://www.esrl.n...rends/). Also if you are going to describe how to set up an experiment you might want to think of ways to actually control the variables. Opening windows modifies water vapor, CO2, temperature, even air circulation. Alche/WaterBowl: Try your poorly controlled experiment that is supposed to show how powerful water vapor is with a thermometer to measure the temperature, not how it feels on your skin. Why: you ask? Because your skin is sensitive to evaporation which changes dramatically with humidity. Of course we have told you that before but you have just ignored the fact that you are changing the cooling that your skin is doing by changing humidity. All this argument about cause of warming - fiddlers while Rome burns I say. You're all missing an important point. An enormous amount of fresh water is being lost to the sea when it could easily be harvested and sold (or donated as aid) to arid countries in desperate need of quality potable water. Indeed, what are the results in Watts per square meter ? U have made very dumb & unscientific claims about CO2 being a "red-herring" and relying on relative comparison with H2O BUT, you forget or ignore that CO2 has not only different infra-red bands but also different vibrational states and thus its effect is cumulative ! Why can't U Water_Prophet, someone claiming "4 technical degrees" including Physical Chemistry NOT be able to quantify the thermal resistivity of CO2 in the SAME physics units so it is directly comparable to Total Solar Insolation which is in Watts per square meter (W/m^2) ? Why also is it Water_Prophet, that all your so called 'intuitive logic' comes to nothing, it cannot ever be proven or used in any format to arrive at a definitive outcome ? This makes you look egotistical, immensely naive, stupid & a TOTAL waste of time ! .. drinking a glass of water and drowning in it. It feels much warmer to your skin with humidity, and the stove feels cooler..
U rely on feel only = U R immensely naive & immature ! You've been told before, yet repeat same errors, ie U R stupid ! No scientist who knows ANYTHING about "Experimental Methodology" would ever be so very STUPID like U Water_Prophet, to ever craft such a flawed 'Experiment'. There are so many errors not least of which the perspective of a 'control', the measurement methodology and in respect of CO2 - the path length ! WTF is wrong with u Water_Prophet, u are going to a LOT of inane trouble to prove, of all things, u cannot learn anything to ever prove your claims CO2 is "anemic". Tell us where you got your "4 technical degrees" including Physical Chemistry ? What speed did u spin your water bowl to predict the 1998 'warming pause' ? Why not? we ship oil everywhere, water is more valuable and easier to mine. More valuable as in "a biological necessity" or in $$$? Really, Whiffen_poof, it is atrociuosly ignorant gaffes such as this --and the inevitable conclusion that your understanding is so severely limited as to be nonexistent-- that provide abundantly clear evidence that NO CLAIMS regarding ANY subject made by you are to be taken seriously. The Hubbard Glacier in Alaska is expanding. This fact does not fit well with the alarmist propaganda being peddled in this article. The Hubbard Glacier is too small to be a good reference. There are many factors that could influence an area like that. Warmer winds hitting farther North comes to mind, just by example. Clue: The all ring the southern side of Alaska and would the accumulation areas (min elev 11-18,000ft for Hubbard) would see snow from the Pacific first ... which has been warming in response to GW and a largely -ve PDO (more moisture available) since '98. The story should be about the fertilizing of the off shore ocean. These minerals are going to create a rebirth if only temporary for the base of the ocean food chain. But of course, if the trawlers are sitting there scooping up the fish, it will all be for naught. We need to protect these off shore areas by declaring them no-fishing zones. NZ has done so and it has restored the shallow coastal areas. The trawlers sit off the flagged zones and still harvest well. Why is change important? It is not. It is concentration, concentration is 400pp, change is 135ppm CO2. Indeed, water vapor has changed 3x as much (435ppm) and it is a more powerful GHG. Control CO2: CO2 meter, baking soda + vinegar, the home normally has 3-4x the CO2 outdoors do. Temperature: thermostat set to outdoors. The effects are so large you don't need them. You can't detect changes in CO2, until about 20x, small changes in water vapor are noticeable. Now evaporation will make your skin feel cooler. So if you still feel warmer despite evaporation, then you really know how much more powerful H2O is than CO2. But probably not. You'll probably just be all sweaty and sticky, and eventually become so uncomfortable that you say "f**k Whiffen_Poof and his stupidiotic experiment", and go down the pub for a pint or two, while all that excess humidity dissipates. Condensed copy below, so many fundamental errors of report already LOL ! Suffice to say, the immense lack of detail, references, even addition, sad testament he hasnt done any uni study let alone those claimed "4 technical degrees" ! NB for ubavontuba, you could have gone to uni since you joined here and done SO much better & so easily ! Tell you what Mike, I did a little bit of work here, you go ahead and try to debunk the numbers while I criticize your techniques. That's fair play isn't it? After all, if I start proposing, you'll just provide substance-less criticism, this way, at least the criticism will have substance. Do u see Water_Prophet Y its OBVIOUS u have NO idea or faked the figures ? Your CO2 & multiply by highest "2 orders of magnitude" ie 499 then multiply by difference in ppm ie 400-280 hey guess what ! No. There is no Evidence of any actual work, well unless you crafted a way to fake figures so they are much lower than the figures you vaguely refer to which are on wiki, see the wiki link in my previous post here ! No. For very obvious reasons, you have NOT offered any references re source of data and NOTHING to show your methodology of crafting the figures AND the numbers totally ignore concentration. Unless you are a complete fool you MUST accept the ppm is subject to change so OBVIOUSLY your figures, to have any credibility AT ALL MUST include concentration eg CO2 in ppm ! We, Mikey, I don't see you putting anything cogent for your own demonstrations of how my numbers are wrong. What result do you calculate? Why does it contradict my own? @Curiousman; If CO2 started at 10ppm, then 400pmm would mean that the effect would be much greater. The fact is it is the concentration, the percent increase is a fallacy. Water vapor has increased 3x more than CO2, and it is 7x? time more powerful, yet nobody is strumming any harps over water vapor. Where are Ships from S. Arabia? Have done so on another thread but, the onus is FIRST on you to show where YOU got your figures as YOU are the one making the claim in the first place - what aspect of scientific literature reporting protocols don't u understand, showing even MORE ignorance ? Can U not see the STAGGERING difference ? Elsewhere u claimed there was agreement - how is it possible yours are 16,666x LOW ! I remind u AGAIN - the onus is on u to show origin of source data & methodology ! U have also failed to answer why u did not use runrig's figures ? Stop messing around u d..k, have integrity & try being smarter ! For OBVIOUS reasons told u MANY times but, because u are so ignorant of physics & respective causal relationships u CANNOT understand the significance that Water Vapour has easy & direct return to Earth in as little as days whereas CO2 takes > 100yrs to even drop a little so OBVIOUSLY water vapour & its interaction with air re humidity/dew etc is being held up by increased thermal resistivity of CO2. If u were a real scientist Water_Prophet, u could craft a PROPER test with a correct "Experimental Methodology" to show that combinatorial effect easily ! Its easy Water_Prophet but, u need to under Psychrometry & calculate the minimum size of a test chamber to be representative & scalable for some proportionality to an atmospheric equivalent. But, of course, u should know its already done long ago ! wanna know why your Dunning-Kruger will not let you see reality?